The findings of a survey on the super-rich Albanian people during 2016 were unveiled on Wendsday. The survey conducted by Pashko European Institute, part of the European Education Initiative, and Mapo Publications referred to an analysis based on the official data of balance sheets submitted at the National Business Center. Mapo.al says that the methodology used for the survey shows best international practices used by Capgemini, KnightFrank, and Wealth-X. These practices were adapted to the Albanian contexts. Moreover, the survey method focused on two main components realized gain or profit and equity. Further on, it is highlighted that the businesses that didn’t declare their profit are positioned below in the list. 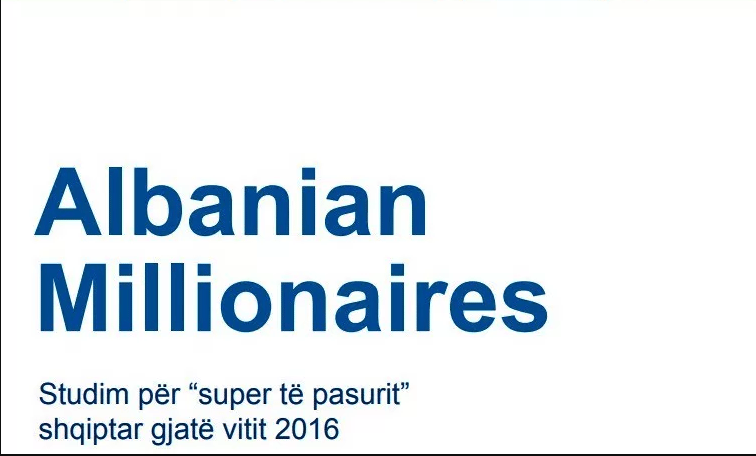 But who are the ten richest Albanians for 2016 according to the above-mentioned survey? 1. Samir Mane – President and owner of Balfin Group. Services: Construction of commercial and industrial areas, investments in agriculture, and tourism. Based in Tirana. 2. Shefqet Kastrati – President of Kastrati Group. Services: oil trading and storage, financing, chartering. Based in Durres. 3. Vasil Naci – CEO and President of AGNA Group. Services: import and distribution of drinks, food, home and personal care, Tobacco, outdoor advertising, leadership academy, advertising agency, property development, hydro energy. Based in Tirana, but the company has expanded its activity in Greece, Kosovo, Serbia, and Montenegro. 5. Tom Doshi – Lawmaker, one of the richest members of the Albanian Parliament, and administrator of several companies. 6. Rrok Gjoka – Owner of Gjoka Construction. Services: industrial and civil construction, transport infrastructure. Based in Tirana. 7. Grigor Joti – CEO of InfoSoft Albania. Services: technological consultation, implementation and support services, system integration of large, medium and small sized organizations. Based in Tirana. 8. Idajet Ismailaj – Owner of Albstar Ltd: Services: Engineering works, transport infrastructure, design of civil and industrial works. Based in Patos, Fier. This is the third year that this survey is conducted. Here are the lists of the top ten richest people in Albania for the two previous years.